Bookphilia.com: Why are baby carrots trying to turn me gay? 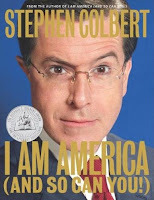 I love The Colber' Repor' and was therefore a little worried that Stephen Colbert's book, I Am America (And So Can You!) would be a pale shadow of the TV show's genius. Indeed, in an instance of my reader-stalking that didn't end up in an installment of Curious/Creepy, I saw a woman in Trinity Bellwoods Park reading I Am America and not laughing. She wasn't laughing. At the time, I didn't know whether this meant I should avoid reading the book at all costs (and avoid the pain of watching an idol shitting the bed) or assume that she was entirely humourless and therefore destined to be among the first up against the wall when the hilarity revolution comes. I decided to reserve judgment but was eventually unable to resist the book (for I love right wing pundits as much as the next guy) and have been reading it slowly over the past couple of weeks. Friends, I was not disappointed. Colbert and his crack team of underpaid ghost-writers have produced a book worthy of the show. Indeed, this had all the awesomeness of the program with none of the sometimes not entirely excellent interviews or musical guests. That said, Colbert truly hooked me in an interview when he unexpectedly asked the guest why baby carrots were trying to turn him gay (because they made him feel all tender or something). If I was drinking anything at the time, be assured that upon hearing this query I immediately sprayed said drink all over myself, whomever I was with, and the TV. I think that's a sign of comic virtuosity that cannot be denied! And that's my Word on I Am America (And So Can You! ).